At Aria Systems we spend a lot of time thinking about the ways in which our technology contributes to businesses seeking to capitalize on the ever-changing ways to engage with customers. 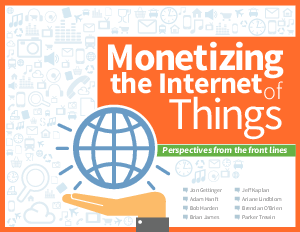 Our collective interest in the IoT and its organic overlay with a long list of monetization models should be self-evident if you’ve been reading this Internet of Things anthology series. As We embarked upon this effort it quickly became obvious that it would be a disservice to our readers not to elevate our thinking. We needed to go beyond what was strictly relevant to the IoT’s capacity for monetization and include perspectives that looked at the IoT from other angles.